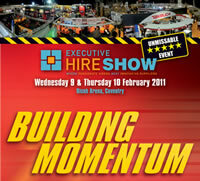 The 2011 Executive Hire Show promises to be the best ever as Armorgard make their debut at the show in Coventry. Held at the Ricoh Arena on 9th and 10th February, we will be found on stand D8 in the back left hand corner of the hall. On show will be a variety of products from the Armorgard range, including the new ‘Ring2Release™’ locking system and the new Xena alarm padlocks. Armorgard have now set up a dedicated repair workshop which specialises in maintaining and refurbishing site storage equipment. Particularly used by the hire industry, perhaps the most.